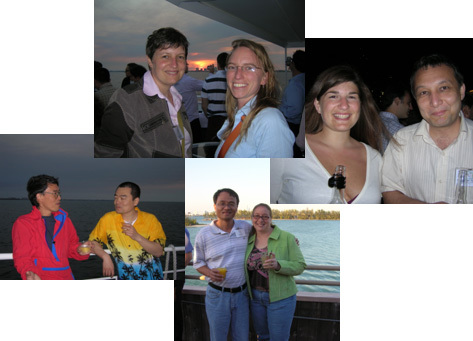 The 2007 Meeting of Study of Matter at Extreme Conditions (SMEC) from April 15-20 in Miami was a great success. The conference was sponsored by CeSMEC and CDAC, and featured 46 scientific presentations from CDAC affiliated scientists (including 41 abstracts and 5 Symposia Panel Talks). Graduate students and post-docs at CDAC institutions included Resul Aksoy (Texas Tech), Emre Selvi (Texas Tech), Lowell Miyagi (Berkeley), Wendy Mao (LANL), Michelle Weinberger (Carnegie), Matt Schrenk (Carnegie), Muhetaer Ahart (Carnegie), along with new CDAC-Affiliated Staff Member Takamitsu Yamanaka and former CDAC students and post-docs Jennifer Jackson (Caltech), Sebastien Merkel (Universite des Sciences et Technologies de Lille), Sung Keun Lee (Seoul National University), Eugene Gregoryanz (University of Edinburgh) and Kristina-Lipinska Kalita (UNLV). Symposia Panel talks were presented by Carnegie staff members Alexander Goncharov, Yingwei Fei, and Ronald Cohen, as well as HPCAT scientists Haozhe Liu (with Martin Kunz from ALS) and Hanns-Peter Liermann (with Hyunchae Cynn from LLNL).